↑ 1.0 1.1 Mark Sinclair birth record, California Birth Index. Retrieved on March 29, 2015. Some sources give birth name as Mark Sinclair Vincent, which is at odds with the official California state birth record. ↑ "Diesel breaks silence over Walker". Press Association via The Press (Christchurch, New Zealand). 3 दिसंबर 2013. 6 अक्टूबर 2014 के ओरिजनल से पुरालेखित. पहुँचतिथी 21 मार्च 2015. 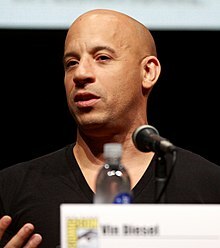 ↑ 4.0 4.1 "Vin Diesel Biography (1967–)". Filmreference.com. पहुँचतिथी सितंबर 8, 2010. ↑ "Vin Diesel: From nightclub bouncer to action hero". CNN. अगस्त 12, 2002. ↑ "Vincent, Irving H". encyclopedia.com. पहुँचतिथी जून 29, 2013. ↑ Vincent, Mal (जून 22, 2001). "'The Fast and the Furious' Vin Diesel Opens the Throttle in New Speed Movie and Joins an Elite 'Action-Star' Fraternity". The Virginian-Pilot. Norfolk, Virginia. पहुँचतिथी मार्च 2, 2008. ↑ "VinDiesel explains why Glasgow was perfect to shoot Fast 6". मई 15, 2013. ओरिजनल से जून 18, 2013 के पुरालेखित. पहुँचतिथी 29 जून 2013. ↑ Carter, Gregory T. (2008). "From blaxploitation to mixploitation: Male leads and changing mixed race identities". में Beltrán, Mary; Fojas, Camilla. Mixed Race Hollywood. New York: New York University Press. प. 210. ISBN 0814799892. ↑ 10.0 10.1 "definitely a person of color"- "Diesel is running hot". Jam.canoe.ca. February 17, 2000. ओरिजनल से दिसंबर 6, 2009 के पुरालेखित. पहुँचतिथी सितंबर 8, 2010. ↑ Chu, Hanna (अगस्त 26, 2013). "Vin Diesel receives star on Hollywood Walk of Fame". KABC-TV. पहुँचतिथी दिसंबर 6, 2013. ↑ Pearlman, Cindy (August 9, 2002). "Fame game stumps Diesel". Chicago Sun-Times. पहुँचतिथी जून 29, 2013.